Storing items for however long may seem like the most basic thing, although there is plenty of things people don’t think about when storing. These can result in disgusting outcomes or ruining precious items. 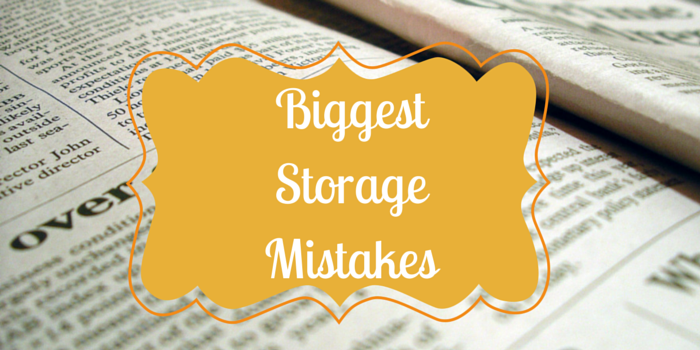 Storage facilities are not responsible for any losses. It is best to check with your insurance company to see if your homeowner or renter’s policy covers items placed in storage. If your insurance company does not cover it then you might want to see what storage insurance the storage company offers. It can be easy to forget about food and leave items in boxes or lying around after a tiring day of moving boxes and furniture. This is one mistake you don’t want to make. Leaving food in your storage unit can attract pests. Not only will this be bad for your storage unit but also for other’s around you. The obvious problem with leaving food in a storage unit is that it will mould/rot cause an unpleasant odour. Failing to label your boxes can turn into a stressful situation when trying to look for a specific item. The clear solution to this is labelling your boxes with exactly what is in there. If you know you’ll be going to your storage unit regularly and looking for items, a good idea is to put frequently used items at the front. This way it will be quick and easy to find important items. Refrigerators, freezers, washing machines etc. all need to be properly drained before being stored. You might believe that water in these appliances will evaporate and be fine, although this is not the case. Residual water can lead to water damage or mildew. This will potentially ruin your appliances. Many people will use newspaper to package their items up. This is actually one of the worst things you can do. The ink from paper can begin to bleed and smudge over time and ruin belongings. This is not easy to remove. The greatest solution to wrapping items to put into storage is using bubble wrap, ink-free paper or cloth. Remembering these key points can prevent your items being ruined or lost. Being organised is the top way to store items efficiently.